Breaded cheese stuffed jalapenos served with green chile queso. with either Ranch, Blue Cheese or Marinara dipping sauce. Generous portion of our battered and seasoned fries topped with red or green chile, queso, shredded cheese and crispy bacon. Crispy potato skins smothered with cheese and topped with chives, crispy bacon and sour cream. Naked spicy wings served with choice of one dipping sauce and celery sticks. Dipping sauces: Hot, Mild, BBQ, Teriyaki, Ranch & Bleu cheese. Generous slices of cheese, bacon and green chile packed between two slices of grilled sour dough bread. Well its our grilled cheese. How much more simple do you want it? Pepperoni, Genoa salami, ham, mozzarella cheese, sliced pepperoncini, lettuce, tomato, pickle, onions and Italian dressing piled high on a hoagie roll. Fresh made in house chicken salad spread high between two slices of your choice of bread. Well it describes itself. Ham and American cheese piled between two slices of grilled sour dough bread and of course, served hot. No explanation necessary, it's bacon, lettuce and tomato between two slices of your choice of bread. Substitute cheese for the tomato and make it a BLC. Like his little sibling but twice the B, L, & T (or C) between three slices of your choice of bread. Think of it as a BLT club. Piled high with roast beef, Swiss cheese, sauteed peppers and onions between two halves of a hoagie bun. Like the original, just done our own Effing way. What is there to say - it's an Effing Philly without the cheese and veggies and served with au jus. Turkey breast, green chile and Swiss cheese piled high between two slices of grilled sour dough bread. Yeah we know, technically it's an Albuquerque Turkey. Crisp bed of iceberg lettuce topped with tomato, shredded cheese and croutons. Crisp iceberg lettuce topped with ham, shredded cheese, mushrooms, diced celery, croutons and a sliced hard boiled egg. Bed of crisp iceberg lettuce topped with Randy's own hand-made chicken salad and garnished with tomato wedges. Starts with our house salad and add either grilled chicken or Certified Angus Beef (TM) steak, cucumber slices, blue cheese crumbles and salsa on the side. Bed of crisp iceberg lettuce topped with diced chicken, crispy bacon crumbles, diced tomatoes, avocado slices, blue cheese crumbles and sliced egg hard boiled egg. All our burgers are Certified Angus Beef (TM) hand formed and cooked to order*. Served on a grilled sour dough bun and garnished with lettuce, tomato, pickle and onions. 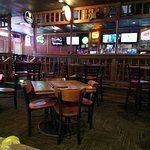 Burgers come with choice of one of the following sides: fries or half order of onion rings, potato salad, side salad or cole slaw. Our classic bar burger topped with a slice of American cheese. The classic bar burger with you guessed it, topped with two strips of bacon and a slice of cheese. Starts with the classic bar burger and topped with what else, mushrooms and a slice of Swiss cheese. The classic bar burger topped with American cheese and green chile. Classic bar burger patty topped with grilled onions and Swiss cheese, served on grilled light rye. Classic bar burger and shredded cheese wrapped in a flour tortilla. Served hand-held or smothered in red or green chile. Our classic bar burger topped with a cheese filled chile relleno. Served open faced and smothered in red or green chile. Our biggest Certified Angus Beef (TM) patty served open faced on a sour dough bun. We smother it in cheese and choice of red or green chile. Just like our Effing Chile Burger, we just hopped across the border with our neighbors and smothered it in their style of chili. Three chicken or beef tacos (crunchy or soft) topped with lettuce, cheese and tomatoes. Served with beans and rice. 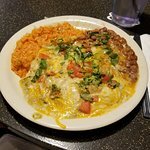 Triple layer of flat stacked cheese enchiladas smothered in red or green chile. Garnished with lettuce, tomato and onions. Served with beans and rice. 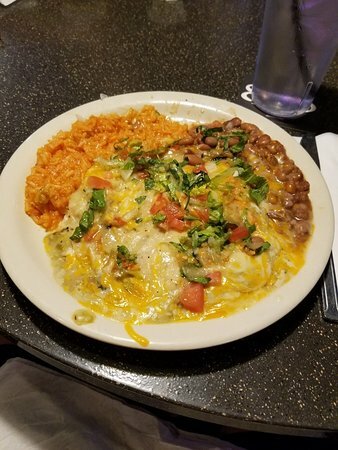 Two eggs cooked the way you want resting atop a warm flour tortilla and smothered in red or green chile. Served with hash browns and beans. Garnished with lettuce and tomato. Sunday special, 2 for 1 Huevos, so bring a friend. All our steaks are Certified Angus Beef (TM) brand to ensure you the best possible cut we can provide. Two pieces of beer battered fish fillets served with fries, cole slaw and tarter sauce. Beer battered jumbo shrimp served with fries, coleslaw and cocktail sauce. Certified Angus Beef (TM) strip, hand cut from the loin. Cooked to order* and served with choice of two sides. Our classic bar burger with your choice of fries or side salad and an Effing draft, soda or iced tea. 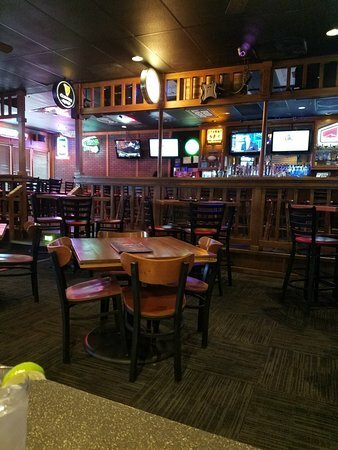 Choose from one of the sandwiches* with a side salad or fries and an Effing draft, soda or iced tea. Grilled breast of chicken on a bed of lettuce, served with cottage cheese and fruit cup.